Locally elected school boards are the only entity that has the mission of keeping public schools public. They have a vested interest in retaining public control of schools and ensuring quality education since their actions directly impact local community life. Richard Brake, a Republican, was defeated on Election Day in his attempt at a second term on the TE School Board; losing to Democrat Scott Dorsey. Monday, November 25 marks the final school board meeting for Brake, Betsy Fadem and Anne Crowley. On Monday, December 2, the torch is officially handed to those newly elected to serve the school district, including Dorsey, Doug Carlson and Virginia Lastner. The defeat in a local election is not what defines you. I hope that Dr. Brake and other school board (and township supervisor) candidates defeated in the recent election will take the words of Andre Malraux to heart and remain involved in the community – it’s important. The following is an editorial written by Rich Brake which appears in the print version of Main Line Suburban this week. You win some, you lose some. That’s what I told my family and friends after I lost my re-election bid for T/E School Board. As a lifelong Cubs fan and former competitive long-distance runner, I have experienced defeat much more than victory, and so I know that you always learn more from your losses than your wins. I also believe in Providence, and that it is likely that as this door closes, others will certainly open and new opportunities for service will present themselves. I very much enjoyed my time on the Board, and hope that I performed some small public service for the benefit of our community. The bottom line is that the sun rose the day after I lost, and since politics at all levels remains a peripheral part of our lives (which is a good thing I think, though not without its downsides), it would be wise to keep this small little episode in its proper perspective. With that said, I am reminded of a saying one of my graduate school professors was fond of repeating – “If you’re not interested in politics that’s too bad, because politics is always interested in you.” So I do think that there are important lessons to learn from this campaign season. It is also the case that it is hard to have your entire life’s work, and the principles that this work represents, pilloried, caricatured, demonized, and ridiculed in front of the entire township. It is natural, then, to try to make sense of a difficult experience like this – was it something I said; was it something I did? Are my principles that reprehensible? Did I allow them to blind me to the real issues we faced on the school board? When I look into the mirror, I don’t see a monster or a label, but a flawed but nevertheless dedicated father, husband, educator, veteran, and public servant – but I know that we all come-off very differently to others than we do to ourselves, and maybe some of the problem was not what I said but how I said it. Regardless, it was clear on election day that there were a lot of people that didn’t like me, or what I supposedly stood for, and that is a bitter pill to swallow, especially when you have to explain this to your kids (by the way, I don’t want to teach creationism in the schools, and have no idea where that outright lie came from!). Obviously I could have done a much better job communicating to the voters who I am and what I really stand for, but it is also the case that the other side bears a great deal of responsibility in creating a false and misleading picture of me. Politics ain’t beanbag, to be sure, but I brought a water pistol to a bazooka fight, and that kind of negative, name-calling brand of politics unfortunately won on November 5th. As a result, I’d like to spend the rest of this piece examining the case my opponents built against me; whether that kind of campaign, though successful in the short-term, really serves the best interests of our community; and whether someone like me, with the principles I believe in, should be or will ever be allowed, to serve the public trust here in Tredyffrin again. Along the way I hope to suggest a more optimistic, collegial, and effective brand of local politics than the slash and burn variety that we have witnessed these last two election cycles. So why did I lose? Four years ago I won by 400 votes, 55%-45%. This year I lost by over 200 votes, even though I garnered more votes this year than four years ago. So what happened? From a sheer numbers perspective, the Democrats turned out their base more than the Republicans did, and in a local race like this, turnout is everything. How did they do it? Simple. They labeled me Tea Party to their supporters – and successfully tarred me with the residue of the recent partial government shutdown, the responsibility of which – rightly or wrongly – has been placed by many at the feet of so-called tea party republicans in DC. In other words, instead of focusing their campaign on local issues, the democrats nationalized a local election (sometimes Tip O’Neill is wrong; politics is not always local), and the white-hot antipathy local democrats have for the tea party convinced many more of them than usual to come out and cast their ballots not only against me, but other republicans as well. Now there is a lot to say about these tactics. First, I think that the partial government shutdown was a collective failure to compromise on the part of the entire elective branches in Washington, and not just some vocal faction that controls only one house out of three. And with the recent problems with the disastrous roll-out of Obamacare, we will just have to see how this DC morality tale plays out in the weeks and months ahead. I also think that by and large, local campaigns should be about local issues and not distant fights in far-away capitols (I will have more to say about those local school issues in a moment). I have no problem with a vigorous and aggressive exchange of views that draw sharp distinctions between candidates. That is the heart of elections – a debate about competing ideas – and as long as those fights are fought on the merits, I am happy to accept the verdict of my community if they feel my ideas won’t work to solve the pressing issues of the day. But that is not what happened here! What did happen was a classic case of guilt by association. What heinous thing was I guilty of being? Why, a conservative of course, and working in the conservative movement and with local tea party groups on their constitutional education classes. So let’s deal with the charge of being a conservative. I am a constitutional scholar who has a great reverence for the founding principles of our country, and have spent most of my life teaching the story of our country and its animating leaders and ideas to high schoolers, college students, and ordinary citizens who have expressed an interest in learning more. That’s what I do at the Intercollegiate Studies Institute today, and I am proud of our work in teaching American first principles – constitutional government, free enterprise, individual liberty, personal responsibility, the rule of law, and traditional moral values. Since when have those principles become dangerous and subversive? So again, I guess I am guilty of being a conservative, and I happen to be a conservative of the Edmund Burke, G.K. Chesterton, Russell Kirk, Robert Nisbet, and Ronald Reagan variety (just to name a few, along with founding fathers like John Adams, James Madison, John Dickinson, and Richard Henry Lee). If you don’t know who these guys are, look them up and tell me if you disagree with them. As a “traditionalist” conservative (www.imaginativeconservative.org), I have great sympathies for localism and grave misgivings about corporate “crony” capitalism. I believe that liberty must always be tempered by the requirements of order and the mercies of justice, which means that we have both rights and duties in a free and virtuous society. I believe in community and what some now refer to as “crunchy” conservatism, whose tenets are best expressed on this great blog www.frontprochrepublic.com. I could go on, but I was under the impression that I was running for my local school board on November 5th, which is why I spent all of my campaign talking about my record on the issues, and not about far-away political battles and my particular brand of conservatism. But my opponents had other thoughts in mind. For them, conservatism is not a legitimate rival public philosophy that has a distinguished history and respectable intellectual pedigree. My guess is that the local democrats are completely ignorant of the great thinkers of the modern conservative movement (I can assure you that I know and respect, though disagree with, their great thinkers, like Woodrow Wilson, Herbert Croly, John Dewey, and FDR), and instead rely on caricatures of conservatism from the mass media and their own think tanks and interest groups. No, conservatism has become a dirty word, boiled down to the epitaph “Tea Bagger” – and like the term “communism” in the 1950’s, this neo-McCarthyite name-calling seems to have worked among a large swath of the electorate, not only here in Tredyffrin but across the country. I honestly expected more from such a highly-schooled community, but clearly there is an emotional reaction this term engenders and it does the electoral trick (and as a conservative, I too had problems with some of the tactics employed by our politicians in Washington). I think the main reason why the democrat’s tea party strategy worked is that they equated all conservatives and republicans with the tea party, and then they equated the tea party with one simple word – MEAN. And there are a lot of Tredyffrin residents who view conservatives exactly in this way. We are MEAN because at all levels of government we are skeptical of large government programs, and the growing tax burden they require, actually working to solve the very real problems of poverty, hunger, joblessness, and access to quality health care, housing, and education. But what most people hear, and what conservatives do a horrible job of addressing, is that we are simply against THE PEOPLE who are poor, hungry, jobless, homeless, and lack other basic necessities. And if that was really true, then conservatives would be MEAN, and should not be trusted in public office. Since enough people believed that caricature on November 5th, conservatives like me were shown the door. The only problem with all of this, besides the glaring rhetorical problem conservatives have, is that in my case, I really am not mean. As a devout and practicing Catholic, I do try to practice my faith through good works for the poor, and a helping hand around the neighborhood. I think those that know me, even those on the other side of the political aisle, know this to be true. I really do believe in the parable of the rich man, the camel, and the eye of a needle, and hence know that we can’t serve both God and Mammon, which is why we must be truly charitable with our time, talent and treasure. I guess what it comes down to is that I don’t believe that the only or primary way to be charitable is through large bureaucratic government programs that spend most of their resources not on their poor clientele but on salaries and benefits of an ever expanding government work force (I would be for a complete de-regulation and consolidation of welfare assistance, cutting out the government middle-men, and increasing cash payments to the truly poor for a fixed period of time). And with our ever-growing unpaid debts we are incurring – whether it be in Harrisburg with our pensions or in DC with all of our entitlement programs (and now a new one in Obamacare) – the worry I have is that these unsustainable programs will continue to crowd-out private economic activity that produce the jobs that we all need to pay our mortgages, feed our families, and send our kids to school. The best welfare program still remains a good job! And so to turn the argument on its head, I actually thinks it’s MEANER to continue to rack-up mountains of debt and debase our currency in Washington; not to address our unsustainable pension obligations in Harrisburg; and not to put a brake on higher and higher property taxes here in Tredyffrin – because this failure to act will end up hurting our kids who will be saddled with debt, hyperinflation, bleak job prospects, and lower standards of living; will damage our educational program as more funds are diverted from the classroom to retirees; and will force more seniors on fixed incomes out of their homes. In the end, then, it is MEAN to believe in utopian good intentions and hopelessly complex social engineering schemes that not only fail to ameliorate the true suffering that exists in our fallen world, but will also make it that much harder for those who are trying to play by the rules and be self-sufficient to have the spiritual and material resources they need to take care of themselves and not be overly-reliant on government. As for the actual school board issues that I thought would be the focus of this campaign, I’m not sure that the outcome on the 5th will help us come to terms with the very real problems we all face as a school community. My opponent Mr. Dorsey criticized me for voting against recent school district budgets, and then his party put up signs saying to stop the cuts to our schools and vote democrat. Hmmn? I know that democrats Kevin Buraks and Karen Cruickshank voted for every district budget these last four years, and I voted for one. Who then voted for the cuts? I was for the cuts if they were also coupled with a more prudent use of our over $30 million reserve fund to cushion the blow to taxpayers during a recession. Since that did not happen the last three years, and we raised taxes higher than we should have and still produced surpluses – I voted against those budgets. Someone needs to tell me which side acted rashly and radically? Now that I’m off the Board, I can also make clear that when we were negotiating our last teacher contract, which was indeed better than the last one (but that wasn’t hard – average salaries rose 8% per year under that one with virtually no teacher contribution to health care), we were told by our chief negotiator Jeff Sultanik that our $30 million fund balance was a major liability in our bargaining position with the teachers. That is why the leadership of the Board moved $10 million out of the fund balance into the capital fund where it could not be touched. Now, we do have anticipated capital projects that need to be paid for, but the more traditional approach would be to issue a bond and have more than one generation help pay for the capital expenditure. I would have also developed a more transparent plan to draw down some of these reserve funds in a coherent fashion to help cover our growing pension obligations. Instead, the board leadership decided to use part of the fund balance to give our teachers another bonus to help buy labor peace, and not to give our hard-hit taxpayers a break. I now hear rumblings that the teachers are indicating that they have given all they can give, and that they will not accept further salary and benefit concessions, so my guess is that they will be looking at that reserve fund as ripe for the picking. What will Mr. Dorsey and his allies do then – another pay-off bonus? My guess is that they will also argue that we need more revenue, and with the Act 1 caps in place, they will say that they are forced by circumstances out of their control to adopt an earned income tax for approval by the voters. My position, not surprisingly, would be different. To be clear, I would NOT call for a cut in teacher salaries (just FYI, the average teacher makes over $85,000/year plus pension and benefits for 10 months work), but instead would reduce the rate of growth in teacher salaries by completely revamping the salary matrix, instituting pilot merit pay programs, and asking teachers to pay private-sector levels for their health care. Now that I am off the board, there will be nobody making those kinds of arguments, and your taxes will continue to go up without any commensurate increase in enrollment or academic achievement. Of course these positions I suggest are not easy to take – some would call them MEAN – but I don’t think realism is mean. It’s actually what is called for when adults confront tough issues, instead of relying primarily on emotional appeals. I do think that conservatives need to do a better job of appealing to both the heads and hearts of our community, but that does not mean we shouldn’t make the necessary changes to our system because it might offend those that stand to gain the most from maintaining the status quo. This is what Edmund Burke, the father of modern conservatism, meant when he reminded us that “a state without the means of some change is without the means of its conservation.” In an ironic twist, it’s conservatives like me who are calling for prudent reforms to the status quo financing of public education in order to save the system, while it is forces on the left – the public sector unions and their democrat allies – who are conservatively maintaining an unsustainable system. I’m for change, and my opponents are for the status quo – who is for hope and change now? Finally, a few words about the disturbing tone and declining civility of our local politics. Two years ago I was the only school board member in Tredyffrin who spoke out publicly against some of the tactics employed during that election cycle. The issue was the EIT, and while I am strongly opposed to such a measure, I did think we needed to study it, and probably have a public referendum on it to finally put the issue to rest. There were misleading mailings sent out on this issue, and I took a lot of heat from my side of the aisle by speaking out against them in a public meeting. I also had written a letter to the editor prior to the election making my opposition clear, but the Suburban refused to run it given its timing (I have the letter and emails to prove it). That was not an easy thing for me to do, so I was very disappointed that my opponent Mr. Dorsey forgot what I did and proceeded to launch a negative campaign, not against my school board record, but my closely-held beliefs and educational career. I can tell you that it hurt to have so many people on election-day cast disparaging looks my way, as if I was a leper or worse, because I believe in and work for the Constitution, free enterprise, and traditional values. I guess Mr. Dorsey also forgot how we collaborated together on the bipartisan survey and forum I did with Sean Moir to help increase public input into school affairs. I know Mr. Dorsey is a preacher and believes in Christian values like turning the other cheek, which I certainly plan on doing once I pull the knife out of my back. Eh Tu, Scott? In the end, we need a better brand of politics that treats rival beliefs not as heresies but as differences between means, not ends. We all want the same things for our community, we just disagree on the size and scope of the government that is required to help us get to where we all want to be. I for one would love, as a start, to completely shift the ratio of taxes we pay, so that most goes to our local governments, then the state, and the rest to Washington. If that happened, not only would there be greater accountability, I think you would be surprised by the new political alliances that would emerge, because I know my brand of communitarian conservatism has a lot in common with such left-of-center causes as historic preservation, open space, local agriculture, the new urbanism, and anti-box store campaigns. Now don’t get me wrong. I also think Americans as a whole pay far more in taxes than we should (right now, the average American pays 45% of their income in locals, state, and federal taxes, and I think the maximum should be around 30%). I believe that because I would rather allow Americans to keep more of what they earn so they can practice private charity rather than compulsory government assistance, and to take care of their own problems rather than relying too heavily on government welfare. Of course, you are free to disagree with me on this, but that doesn’t make me mean-spirited (and to think so might make you narrow-minded and overly-ideological). What I am hoping for is an entirely new political paradigm that rejects the old bromides of the right and the left, and the cynical politics of personal destruction, and instead looks hard at the pressing issues of the day and offers common sense solutions and not bumper stickers. And since I now have a lot more time on my hands, I’d be interested in helping begin a new conversation, perhaps even a new coalition, that would be inclusive and not exclusive, that would be open to tea partiers and occupiers, to libertarians and greens, to independents and partisans of all stripes, not because we will always agree with each other, but because we value each other’s opinions and are more interested in the public good rather than private interests that tend to dominate our politics (along with the insiders who benefit from the same old fights). After all, wouldn’t this be a lot better, and a lot funner, than what we just went through this time around? I certainly would hope so. Thank you for taking the time to listen to this apologia, and for the great honor of representing you on the T/E School Board. I look forward to continuing the conversation. Partisan Politics; No need to go to Washington! The Federal government shutdown has magnified the political partisan bickering in Washington. Unfortunately, over the last week, I have had a front-row seat to the local version – I’ll explain. 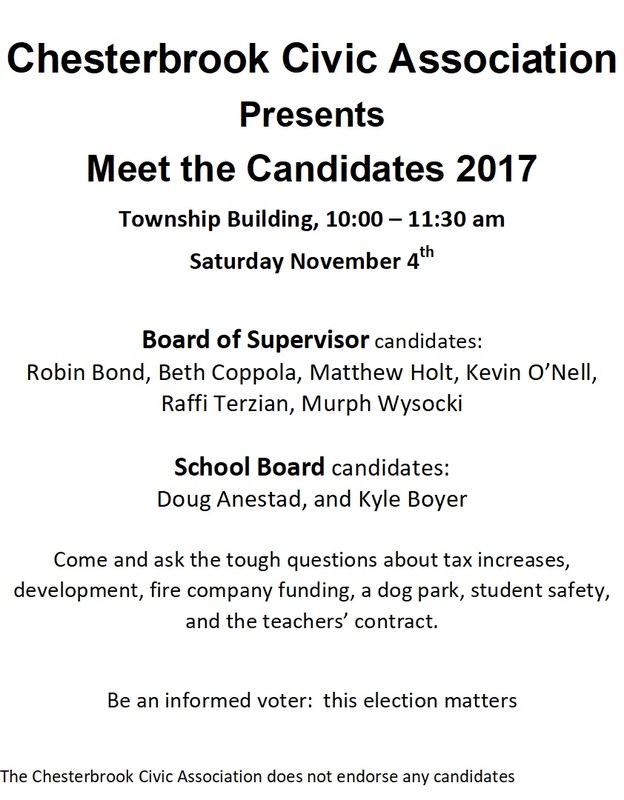 In the last Community Matters post, I mentioned that the League of Women Voters is conducting a Tredyffrin Township supervisor candidate debate on Saturday, October 19, 2-4 at the township building. Knowing that in the past a similar LWV debate was scheduled for the school board candidates, it struck me odd that no such event was planned for this year. I was told that the reason that there was no scheduled TESD school board debate was that the LWV calendar was full and therefore could not accommodate the event. The explanation seemed plausible and I probably would have walked away from the situation except that two TESD school board candidates (Scott Dorsey (D) and Pete Connors (R)) approached me (separately) questioning ‘why’ there was no scheduled school board debate as both were interested in participating in such a forum. This discussion of a ‘Meet the School Board Candidate’ forum occurred last week as I was completing last minute details for the Paoli Blues Fest. Between the Blues Fest and community street fair on October 5, the 9th Annual Historic House Tour the Saturday before and eye surgery in between, I was certainly not anxious to take on another ‘project’. However, believing that more people in our community need to be engaged in local issues and to ‘know’ the candidates before casting a vote next month, a debate/forum needed to develop. Without the assistance of the LWV or any other organization, I first contacted Tredyffrin Township to check available dates/times to hold the forum. To the credit of the Tredyffrin Township staff (particularly the township secretary Pat Hoffman) and the police department, township manager and ultimately the Board of Supervisors, I was given approval to hold the candidates forum on Saturday, October 26, 2-4 PM. If you are wondering why I approached the township for use of their building rather than the library or one of the schools – the answer is simple, cost. There is a fee to use the schools or the library for an event. ‘Meet the Candidates’ forums are central to democratic processes and are an important element of civic action and engagement. In recent years, the League of Women Voters has held these forums for township supervisor candidates and school board candidates. The League of Women Voters will hold a debate for Tredyffrin Township Board of Supervisors candidates on Saturday, October 19, 2 – 4 PM but a similar forum is not planned for school board candidates of the Tredyffrin Easttown School District. This type of forum establishes connections between candidates and residents; allows voters to make informed decisions on election day, gives candidates the opportunity to present their platforms on issues that matter to residents; and gives residents the opportunity to raise issues that they feel need to be addressed by the successful candidate(s). Appreciating that the moderator of the candidate forum needed to be a non-TESD resident, I contacted a friend who is an attorney and a financial planner. With no questions asked, he agreed to help. I then asked four residents (representatives from Easttown and Tredyffrin Townships) to serve on a committee to help with the planning, logistics, marketing, etc of the candidate forum. For the record, two were Republicans, one a Democrat and the fourth a non-US citizen. As a registered Independent, I looked more at choosing people that understood the local school board issues versus their party affiliation. These four individuals were enthusiastic and anxious to help with the event. As stated in my invitation to the candidates, I was utilizing a “grassroots community organizational approach” to this “Meet the School Board Candidates” forum. Of the eight school board candidates, I immediately received responses from five candidates (3 Republicans, 2 Democrats), offering support, appreciation for the effort, willingness to re-arrange personal schedules so they could participate, etc. With a moderator, a volunteer committee, a place, day/time and support from the majority of the candidates, I was feeling confident about this TESD school board candidate forum. Then the rumblings from the local political parties started – I should mention, that my invitations went directly to the candidates, not the political parties that they represent. Believing that elected officials need to be independent-thinkers, it seemed the decision of whether to participate in this public community event should be up the candidates themsevles, without influence from the leadership of the respective political parties. Again, to the credit of many of these school board candidates, there was overwhelming support for the candidate forum. What do I mean by ‘rumblings’ – I received questions about the format, where would the questions come from and how would the questions be asked, would questions come from the audience, (if so, how would they be categorized), would the process be ‘fair’ or biased to the Republican candidates or biased to the Democratic candidates, what political party were the volunteers, etc. etc. The rumblings started within 24 hours of my sending the invitations to the candidates – but it should be noted that not one of the five candidates who contacted me criticized or questioned my motives or my fairness. About the time the local partisan politics started to surface, it mysteriously became known that the League of Women Voters schedule was not full and that they could accommodate a school board candidate’s forum. Imagine that! I knew if ever there was a moment when something was meant as a ‘sign’ this was it. It had become painfully obvious and very quickly, that no matter how I organized this candidates forum, either the local Democratic Party or the Republican Party (or both) was not going to be satisfied with my efforts or the results. The finger pointing had already started and it was only 24 hours since I sent the candiate’s their invitations. If a school board candidate debate was to happen, it was up to the ‘D’s’ and the ‘R’s’ to organize it with the League of Women Voters. I was working on scheduling a TESD School Board Candidate Forum on Saturday, October 26 for two reasons: (1) to provide an opportunity for candidates to present their platforms on important issues facing the TE School District and (2) to give residents the opportunity raise issues that they feel need to be addressed by the candidates. A public forum to discuss school district issues is important. When I questioned why there was no school board candidate forum scheduled as in prior years, I was told that the League of Women Voters did not have availability on their calendar. Based on the information that the League of Women Voters was unable to schedule such an event (and having been approached by two school board candidates, a ‘D’ and an ‘R’), I moved forward to make the necessary arrangements for such a forum. It has now come to my attention that the League of Women Voters is available for Saturday, October 26 to host the forum/debate for the school board candidates. To those candidates that contacted me either with a commitment to participate in the forum or a willingness to rearrange their personal schedules, thank you and your responses were most appreciated. Please know that as a community member and as a registered Independent, my only intention in scheduling a school district candidate forum was to engage more residents in our important school district issues and to allow candidates an opportunity to express their views on these issues. There was no personal agenda on my part. The location, day and time for the school board candidate forum has been reserved for Saturday, October 26, 2-4 at the Tredyffrin Township Building. If you were interested in pursuing this opportunity with the League of Women Voters, I would encourage you to contact your local Republican and Democratic Party representatives. Please accept my apologies for any confusion and best wishes for a successful campaign. The moderator and committee members that I had contacted to help received the same update as the candidates. I thank these five volunteers for their support and willingness to help. So … where does the school board candidate situation now stand? It is my understanding that the leadership of the political parties is working with the League of Women Voters to organize a debate. The last update I received was that the plan was to schedule the school board candidate debate prior to the Tredyffrin Township supervisor debate on Saturday, October 19 at the township building. I look forward to hearing a confirmation on the date and time. It remains unclear why the local Democratic and Republican parties scheduled the supervisor candidate debate with the League of Women Voters and did not do the same for the school board candidates. However, I am hopeful that the school board candidate forum will occur; that important school district issues will be discussed and that candidates can have the opportunity to present their view. In closing, the last ten days has taught me one thing, … whether it’s elected officials in Washington or our local political parties, I recognize that I am no fan of the partisan sandbox. For me, it’s about understanding the issues and then supporting the candidate that best represents my views.